Journalist Clay Aker teams with up with Texas Ranger Julio Ramirez in search of Clay's brother, Jack, an environmental activist who disappeared from the Texas Gulf Coast with his girlfriend, Vicky, while sampling for mercury poisoning. Was their disappearance an accident? Clay is determined to discover what happened to his brother as murder, theft, kidnapping and environmental pollution complicate the search. Multiple side storylines keep readers enthralled as they try to determine the motivation behind the actions of two suspicious boaters, discover a business man's plot to dump toxic waste, learn of an oil tycoon's revenge, follow an unlikely friendship and choose sides in a love story with moral and ethical implications.Color of Blood received the 2009 Reviewers Choice Award for Fiction (Mystery/Thriller/Suspense, Honorable Mention). 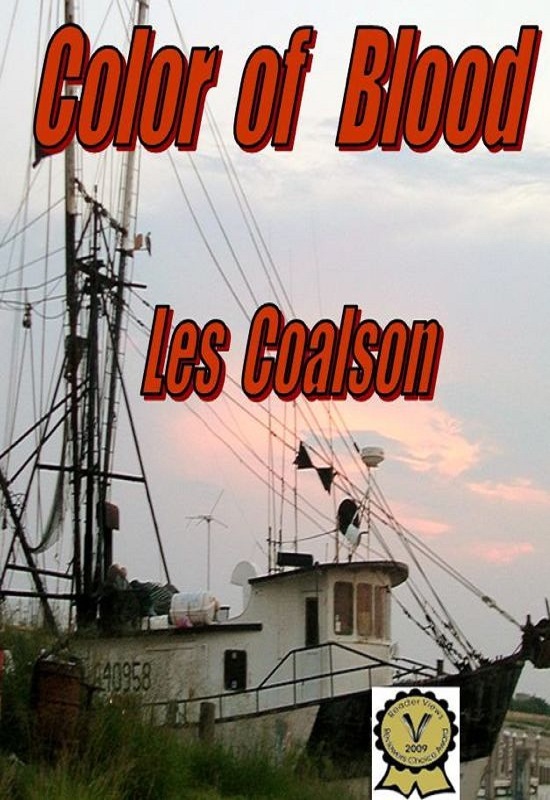 Les Coalson's "Color of Blood" takes the reader on a wild ride through some fairly untamed parts of Texas and into encounters with a couple of very unsavory characters. The main storyline deals with the disappearance of a young couple, Jack and Vicky, who vanish from Jack's boat during a rather routine outing. When Jack's journalist brother Clay starts to investigate their disappearance, it soon becomes obvious that Jack was involved in some environmental issues and very likely about to step on the big guys toes, so Clay starts to believe that his brother's disappearance was not an accident but, rather, the result of foul play. As enthralling as the main storyline was, I found several of the side stories even more absorbing. Julio and Louisa's heartbreaking story presents an ethical dilemma that many people have witnessed in the Terry Schiavo case, but which remains fresh and compelling. Mary Frances and Clay's story is one that so many readers slightly afraid of commitment will find easy to relate to. Jacob's struggle between what's easy and what's right is a classic example of the choices people are faced with every day; and there is no telling which side will win in any of those situations. Vicky's past and to some extent her present will probably make you wince, but you are also bound to feel some compassion for her. All of those side stories and their characters are well-thought-out and very believable. The characters are well-crafted, and I found it easy to relate to them. Although their motivations are pretty straightforward, the story does not suffer for that and does not become boring and predictable.